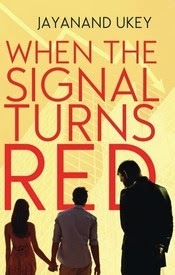 Amid Jaipur travelogues I read this book- “When the Signal Turns Red” written by Mumbai based IT professional, writer “Jayanand Ukey”. This post is a quick review of this book. Any IT professional and campus recruit can easily connect with the story of this book. It revolves around 2 young engineering graduates, who get placed through campus in leading IT companies, but recession results in their offer getting revoked. These two young people, a guy and a girl as you might have already guessed, had big plans for their life, which gets thrown out of gear due to job loss. How they overcome the crisis and re-unite at the end is the core story of the book, which must be enjoyed in reading. Girls father, an ex army man, makes life complicated for the lead pair, as he hesitates to marry his daughter to an unemployed and pursues alternative groom. In all movies, moment TV is switched on, news anchors read out the new item relevant to the movie story (I wonder how it happens all the time in all movies- those who switch on the TV will never have to change channels or wait for specific news to come on). In this book, news watching is very realistic. Characters browse channels and wait for sometime before news they were looking for is broadcast. Liked this realism. Before marrying, financial stability is important. Great love is not much of a use if there’s no income. Not everything can be achieved by fighting/crying/black-mailing. Use your brain. A board room decision to delay joining date resulting in a courier being delivered to all campus recruits same day afternoon is super fast. Ideally this process takes a day or two. Somehow the excessive family scenes with same hypocritical characters (girl should come home before sunset, should marry whoever parents chose etc) have begun to bore me off late. Interesting thought about the news browsing before the relevant news is broadcast. On hindsight, this scene has been kind of done to death but still is being used in films as well as novels etc. Nicely written. Seems to be a good read. Well its good review. But I don't agree on the third point what novel taughts about great love . Rest is OK.